It's almost no surprise that in a perceived sea of green, black and gold mediocrity and corruption Cyril Ramaphosa is often seen as an island, attempting to fight against the ills of an organisation he leads in the hope of winning favour with South Africans and keeping the ANC in power. The president, who often looks worn out has been on the campaign trail, exploring different townships, doing his "Thuma Mina" walk, catching trains and getting stuck, while members of the ANC top six campaign elsewhere. What's been interesting is how much of a lone figure the president has been cutting. In Soweto, only his head of presidency in the ANC Zizi Kodwa and his presidential spokesperson Khusela Diko were at his side, along with some provincial and regional leaders. On the now infamous train ride where he was stuck between stations for hours, only the ANC's head of elections Fikile Mbalula was on a train as well, after all the other officials pulled out of the activation. Gauteng's ANC chairperson and premier David Makhura was also there. But one has to ask, where is Ramaphosa's national executive committee (NEC)? Where are the elders in the ANC? The women? The youth? And the Umkhonto weSizwe Military Veterans Association? Along with heavy handed security, they used to be key features next to former president Jacob Zuma when he took to the streets. The ANC has the task of retaining power in the upcoming national elections, at a time when it's experiencing a serious credibility crisis after years of keeping its head in the sand and failing to address its leadership shortcomings, basically being seen as a paralysed organisation that served mostly to rally behind Zuma and his countless scandals. "You know, Cyril is all we've got," one party insider told News24. "He honestly is the only thing we have going so he has to just keep going in this campaign," said the party insider. The source also told News24 that usually, the NEC would be deployed this close to the elections, also questioning why none of the other senior party members outside of the top six and provincial leadership are being seen on the ground. Ramaphosa, who has polled ahead of the party, is one of the reasons some South Africans have resumed a discussion on electoral reform. Many would like to give him a chance to run the country with a resounding mandate but are reluctant to give the ANC another turn at the helm. In essence, he has a 62% target to beat, which is the percentage of the vote the liberation movement won in the 2014 elections. Should he fail, to those who still refuse to acknowledge him as a deserving leader of the ANC it will translate into another nail in his coffin, which is likely to culminate in greater efforts to remove him as leader come the 2020 ANC national general council. 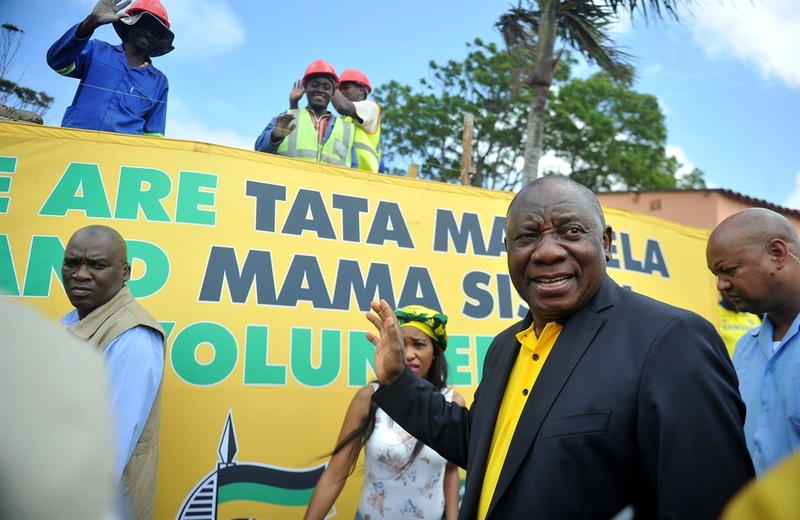 Senior researcher and political analyst at the University of the Western Cape's Centre for Humanities Ralph Mathekga says he believes Ramaphosa runs the risk of falling from grace if the ANC underperforms during the upcoming elections. In addition to the lone figure the president cuts Mathekga views Ramaphosa's language as being at odds with his political party. Commenting on the ANC's candidate lists for members to serve in the National Assembly and provincial legislatures, he says it doesn't fit into the president's anti-corruption message, which he has been using in his campaigns. The lists include controversial figures like Nomvula Mokonyane, Bathabile Dlamini, Malusi Gigaba and Mosebenzi Zwane, who've all had corruption allegations levelled against them. Society has also decried the list saying it is not reflective of his "new dawn" but the same old mediocrity and corruption. "The reality of the party is that members want those people to serve. Names implicated in wrong doing, Bathabile (Dlamini), Nomvula (Mokonyane)… it becomes difficult for the ANC to say the Parliament will be made up of people who want to fight corruption. It's not a good picture," says Mathekga. He also suggests that while Ramaphosa is a much-loved president among South Africans, the same can't be said of how ANC members on the ground feel about him. "He might be popular outside, but his language is quite distant from how some in his party feel. As a leader your voice must be one where members of your party think about what it is you are saying," says Mathekga, noting how isolated Ramaphosa seems. Mathekga suggests a president who is seen to be defined outside his organisation will not be able to convince South Africans to trust him. "He's sweet talking us, saying don't worry about the transgressions of my party over the past few years, we want to get things right. But if the president is not being seen as the dominant voice in the party people will begin to ignore him," said Mathekga. He said the party is almost poised to benefit from the popularity of its president. "But if the president is not seen to be respected in the party the connection will become quite weak and people will ignore him and say we hear you but your own party won't, why should we listen to you as a nation," he added. The ANC Youth League's secretary general Njabulo Nzuza told News24 young people were mobilising for Ramaphosa, saying they had visited numerous provinces ahead of their leader going there. "We can't be standing behind him when he's doing door-to-doors. There is more reach if we do it elsewhere at the same time," said Nzuza. He said there were teams from the league that were following a programme he had developed specifically to lobby young people behind the ANC. "It is going very well; young people still see this movement as their movement and say they will vote for the ANC. Our only challenge really has been gaining access to gated communities. That has been a bit of a challenge," said Nzuza. ANC Women's League secretary general Meokgo Matuba makes similar claims, telling News24 they have been out and about, even with Dlamini, their beleaguered president, but have clearly failed to catch the media's attention. "It's been going well, people still have challenges but appreciate the ANC, they say they still have confidence in us," said Matuba. She says the league has been told about gender-based violence and unemployment while some people are still asking for houses and improved health care services. Even ANC treasurer general Paul Mashatile, who News24 caught up with while he was campaigning in some of Welkom's churches believed other senior leaders were working towards getting their party and Ramaphosa a nod from South Africans. "I don't think you see them," claimed Mashatile, who said he believed the NEC was campaigning. The ANC treasurer general said it also wouldn't be ideal for other leaders to follow around the top six, saying they need to reach out to more community members. He also dismissed claims that some have been de-campaigning Ramaphosa. "I don't think NEC members can go out and de-campaign the ANC, if there is anyone out there who is aggrieved we will deal with them. I don't think there is anyone who will go out and do that," he told News24. Mbalula says everyone has been hard at work, the media just doesn't cover their work. "It's the nature of a campaign that the media follows the head," he said. "We have a fantastic group of hardworking NEC members and if you follow the story on social media you will see them sweating hard, I am confident," continued the ANC head of elections. Mbalula also claimed the ANC and Ramaphosa were in sync. "It's not correct, it's diatribe, it's hogwash spread by our opponents, but the president is on par, he is a revolutionary. He is an ANC leader and they try to dislocate the president from our ANC," he said. The ANC leader said Ramaphosa is loved by many across the country, placing him close to late president Nelson Mandela, as far as popularity is concerned. "He is up there with Mandela in terms of popular stakes, where Mandela carried the party, rather than the party carrying him," he said. According to Mbalula it's a bonus for the ANC to have Ramaphosa as president, like Madiba and former president Thabo Mbeki who both carried the liberation movement. He denied claims of friction at Luthuli House among those designated to communicate the party's election campaign. This, as some within the ANC headquarters have complained that the behavioural change agency used in Ramaphosa's 2017 campaign to lead the party, has now been brought in and has taken over the social media aspect of the ANC's voter drive. Other complaints have been linked to clashing egos, communicators being caught up in factional battles between leaders, which have all resulted in some communicators stepping on each other's toes, incorrect media alerts being sent out, a fair amount of those being retracted and other staffers not knowing what the ANC's officials would be doing on particular days. "No, there is no crisis, our communication might be giving the wrong impression, which is wrong. Luthuli House, we are well oiled," said Mbalula. He added that where there have been retractions of particular messages it's likely because leaders deployed to particular areas changed their minds at the 11th hour. "We are a big party, with huge interests and so on, many commitments, in government and so on… so they get caught up in that," he explained. Mbalula said there was no crisis. "Our crisis is behind us about spokespersons and so on, we may want to intensify liaison with you guys," he said. Ebrahim Fakir, director of programmes at the Auwal Socio-Economic Research Institute (ASRI) and an associate of the Democracy Works Foundation seems to agree that Ramaphosa must pull the cart or, in this case, the liberation movement to the elections, with senior executives openly declaring their preference of the incumbent over the main opposition party, the DA's Mmusi Maimane. Fakir's concerns, however, are about life after the elections, and the kind of government that will steer South Africa forward. "The ANC must wake up, it doesn't want to accept that it's not the be all and end all of society. It must just accept that it's just a vehicle, it's not the leader of society and not the parliament of the people. That's in Cape Town," remarked Fakir. He said members of the party wanted fundamentally different things, adding that this might not have led to a split in the past, due to the fact that they were simply not in government then but are now. "It's not a movement, it's just a party," said Fakir. Fakir said while some in the ANC wanted to dilute the separation of powers prescript, others wanted the focus of the executive authority to solely belong to the president. He also suggested that Ramaphosa should be steering the ANC towards a reality where all the competing views can no longer share space in the same party." Cyril Ramaphosa mustn't worry that this happens under his leadership, he will be doing a service to the country. It's a disservice to the ANC, that's their problem, they are not the country," he said. "Those guys who don't know the general mission of the ANC, they must go away," he concluded.